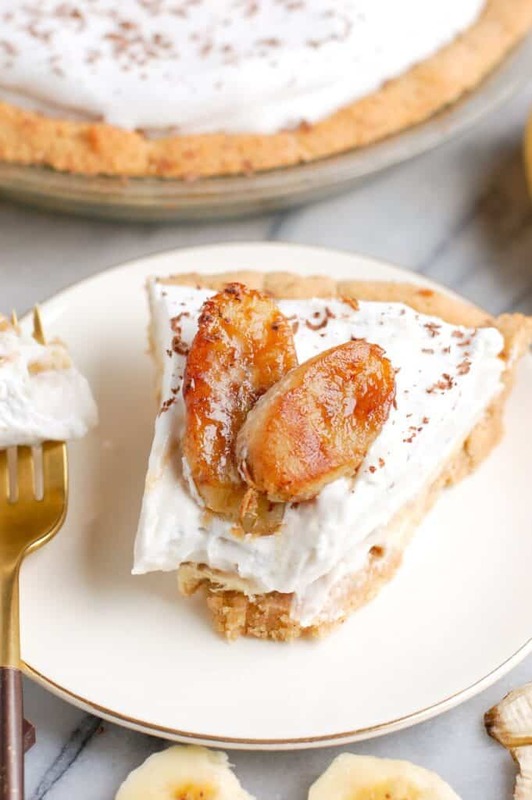 We all have that one dessert that reminds us of our growing up, and for me, that dessert is banana cream pie. 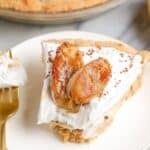 One bite of this healthy banana cream pie and I’m immediately taken back to my first ever job at a retirement home where I worked in the kitchen and the dining room as a server. They had a rotating menu of different pies, crisps, cakes, ice cream, and they always made enough for the servers to have some too. I started that job when I was 16 because parents had always wanted me to get a job right when I was able to drive so I could pay for my own gas and car insurance, but anyway, I worked there for the next 2 years and the best days I had that were there were ones where they were serving my absolutely favorite dessert: Banana Cream Pie. When I showed up at work, I would check the dessert menu almost immediately and if I saw Banana Cream Pie on the menu, I knew it was about to be an amazing work shift. For anyone who put in their slip, they would line-up our dinners and desserts for after our shift ended and I would eat that banana cream pie faster than anyone. It was so good. 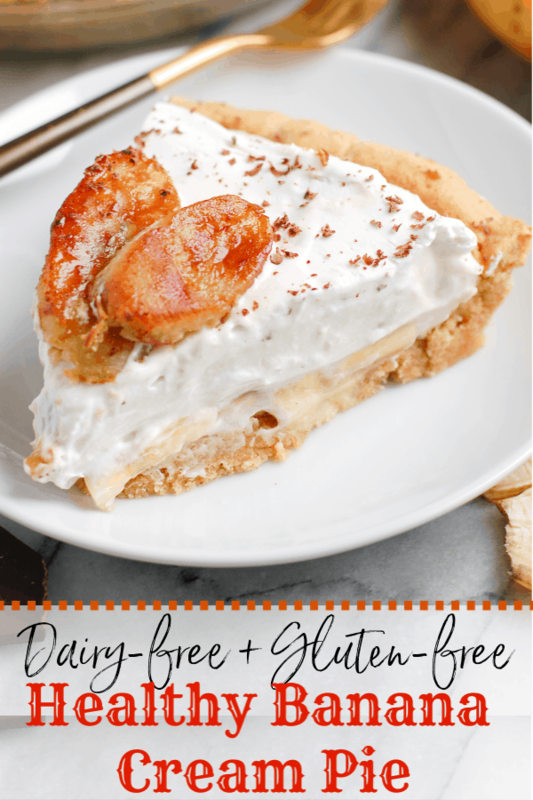 I had wanted to create a version of healthy banana cream pie that was also dairy-free and gluten-free so that it could be enjoyed by everyone! I shared the pie with many people and everyone loved it, healthy eaters and non-healthy alike. It was really easy to make too. 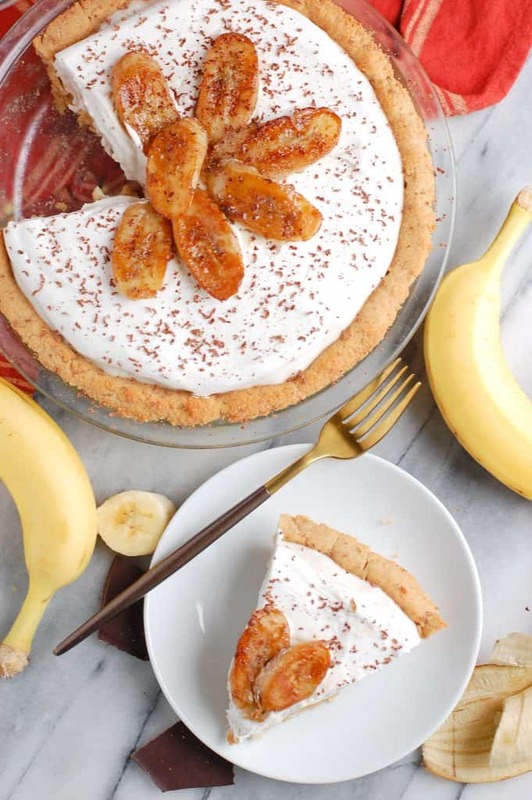 How do you make the healthy banana cream pie? The first thing you want to do is make the crust. It can be prepped ahead up to 24 hours before, or made the same day but needs to be completely cooled before adding anything to it. While the crust is cooling, whisk together the coconut milk and maple syrup over medium high heat on the stove. Once you start to see little bubbles, lower heat to medium and vigorously whisk in cornstarch and water mixture. Keep whisking on and off for the next 2-3 minutes until bubbling again, then turn off heat once bubbles have returned (and keep whisking!). The mixture should be thicker than liquid now and ‘dribble’ when you lift up the whisk. Pour into bowl, cover with wrap, and place in fridge for two hours. While chilling, make coconut whipped cream. Place in fridge to chill. Note that I tried 4 different jars of coconut milk before finding one that worked for the whipped cream – the best brands are Wild Harvest or Whole Foods 365 Full Fat. 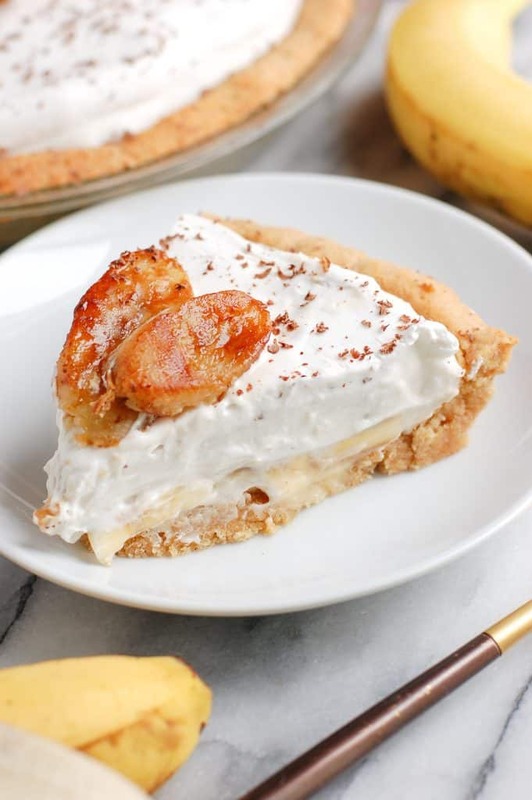 Once the crust is cooled, add a large sliced banana to the bottom of the crust. 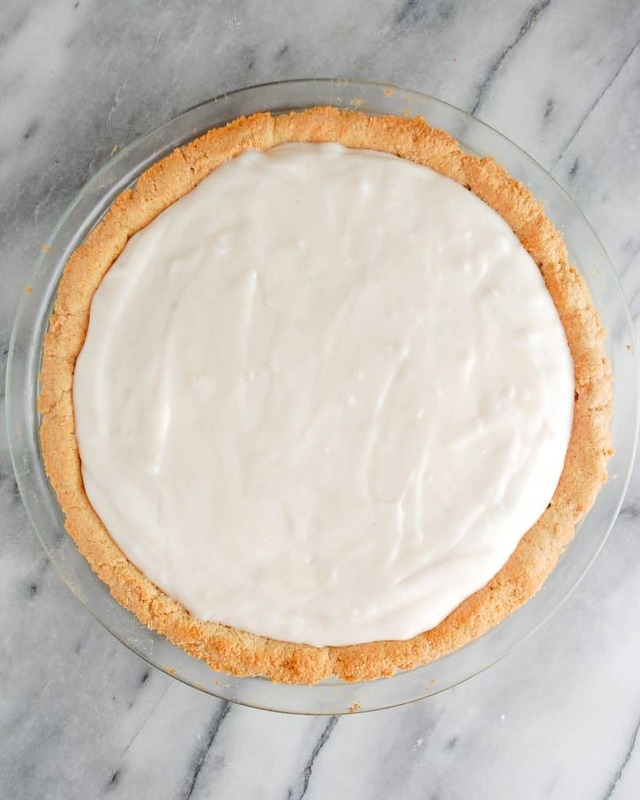 You want to make the slices at least 1/4 inch thick because they will stand up inside the pie. Take the coconut/maple mixture out of the fridge and stir with a whisk to break up any clumps. 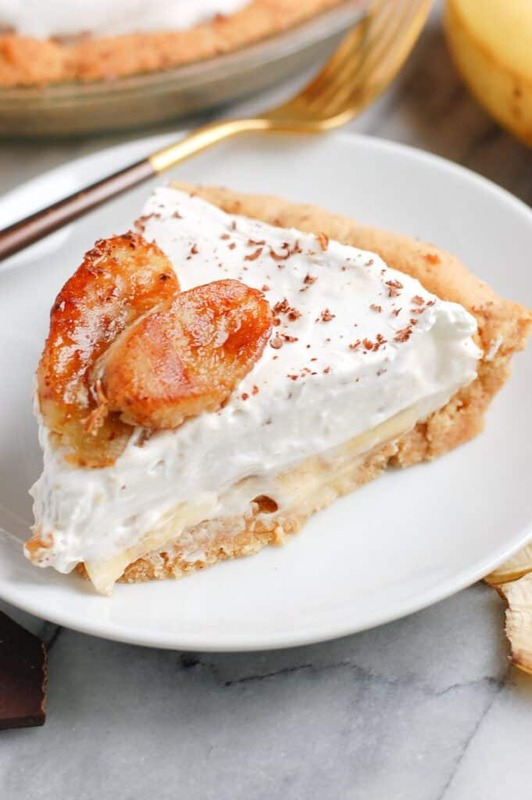 Gently fold in 1/2 cup of the coconut whipped cream and pour on-top of sliced bananas in crust. Place the pie back in the fridge for at least two hours. Top the rest with the remainder of the coconut whipped cream and let sit in the fridge for at least 4 hours or overnight. 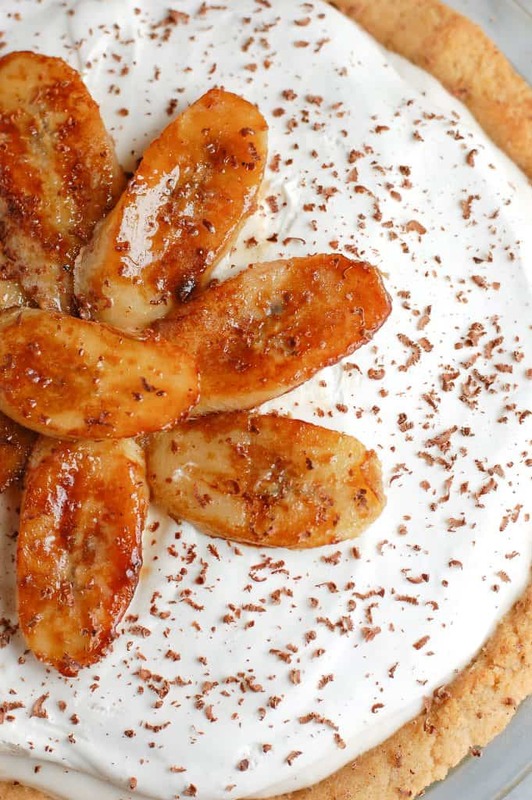 Top with bananas, chocolate shavings, or whatever you would like! I caramelized bananas on the stove with 1 teaspoon of coconut sugar and 1/2 tsp cinnamon. 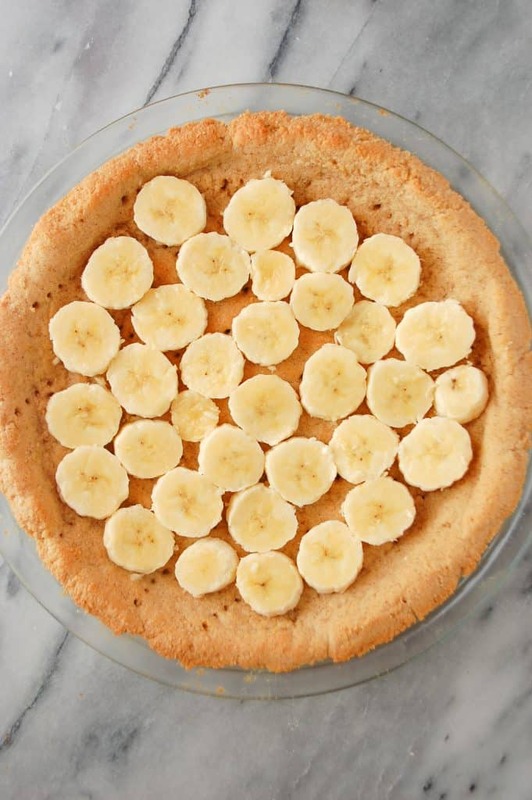 If you make this healthy banana cream pie, be sure to let me know! That makes me so incredibly happy to hear!!!! I bet you are a marvelous baker.